My second 2m rig. With it and my homemade 5 elm yagi I made my first true 2M SSB DX with it to OM G8DER over a distance of 544 km. 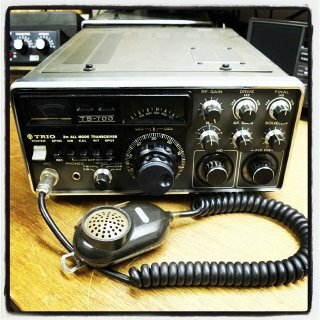 A Mid-70s 2m multi-mode transceiver, 10W in CW/FM/SSB and 3W on AM. Completely analogue and no digital stuff inside. According some OM's, one of the choice 2m rigs of its days. Update 26 november 2014 : After years of excellent service my TS-700 now has a new owner.